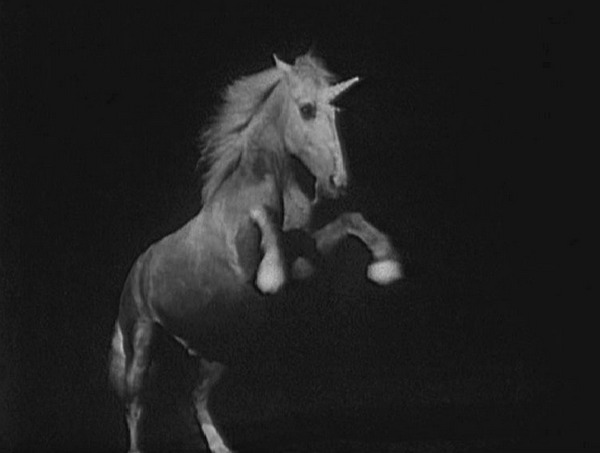 Perhaps the greatest thing about the early years of Doctor Who was its flexibility. It seemed to tell different stories in a way that wouldn't work for modern stories. One story could take place in the wild west, were as another could take place in the far future in the next ice age. Not only did Doctor Who change its settings with each story but it seemed to change genres, most often switching between historical drama's to proper science fiction. There is no other story that demonstrates that flexibility better than, The Mind Robber. The Mind Robber not only takes the story further than it has ever been before and not just out of our physical universe, it reaches into the nature of fiction itself. At the time, this didn't sit well with its viewers many of whom would write into the BBC and Radio Times saying they were confused and irritated by its fantasy laced premise. However and quite rightly, the reputation of The Mind Robber has gotten bigger over time and it really is a good story, even if at moments it can be a little dull and make little to no sense, there is an enduring quality to it that is intoxicating. Any Doctor Who fan will know that change was in the air during the final series of the show to feature Patrick Troughton as the Second Doctor. The viewing figures were dropping rapidly and the creative team behind the show at the time knew that the show needed a major shakeup if the show was to survive into the next decade. 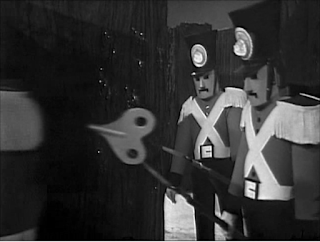 Most of Troughton's first two years in the role had been dominated by base under siege stories. These were stories where the TARDIS and it's crew would arrive in a secluded base with a crew under strain thanks to an outside force trying to get in. There is nothing wrong with that premise, in fact, it is the one plot device that has managed to survive virtually untouched for the past 50+ years the show had been running. It was just that, at that point in time, that sort of story had gone a bit flat and stale. And the show was beginning to look pale in comparison to shows like The Avengers which was getting millions and millions of viewers and was in colour from 1965 with plenty of outside filming and The Prisoner had rewritten the rulebook about what you could now get away with in contemporary science fiction. In 1970, the show got the shakeup it needed with Spearhead from Space. 1968, the year this story was broadcast was slap-bang in the middle of the psychedelic era which had wormed its way into pop culture in a big way. 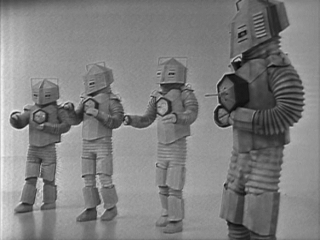 While it had been a part of Doctor Who from the very beginning it had never featured in bigger way. The Mind Robber took that psychedelic feel and pushed it right to fore and played around with the nature of reality in a way that is hard to shake off. 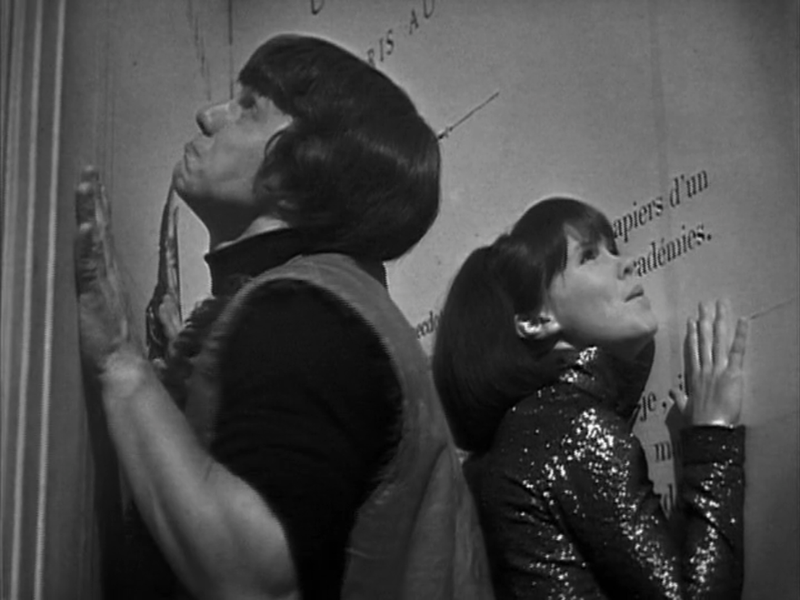 The TARDIS crew at the time consisted of Patrick Troughton as the Second Doctor, Frazer Hines as Jamie McCrimmon and Wendy Padbury as Zoe and like many of the stories in the sixties, the story starts rather abruptly following on from the final moments of the previous story, The Dominators. But it doesn't dwell on that as from the moment they leave that planet the action begins to pick up, the Doctor uses an emergency unit which pulls them all out of time and space all together. 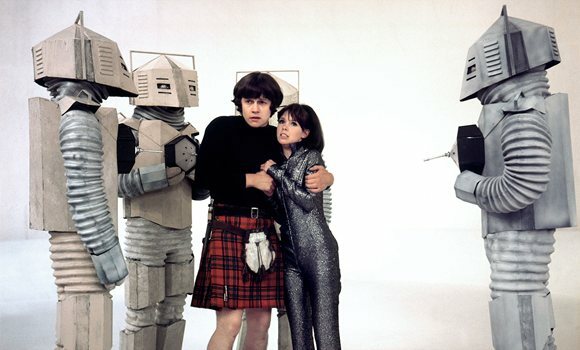 In a land of nothing but featureless white space, Jamie and Zoe are offered glimpses of their homes and are tempted outside only to be menaced by a squad of white robots. But the real threat doesn't lie with the white robots, it lies with a mysterious dream like form that is playing with their minds. 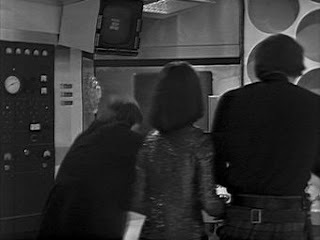 Quickly that power overcomes the Doctor, Jamie and Zoe and the TARDIS explodes in one of the most visually impressive sequences of the entire sixties run of the show. They wake to find themselves in a forest but further exploration leads them to find that the forest is made out of words and those words form phrases such as, in for a penny. They soon discover this place is called the Land of Fiction a place were all fiction is reality and things quickly get really weird as they find themselves up against unicorns, minotaur's and Medusa, not to mention a squad of clockwork soldiers that look like something from The Nutcracker and a group of creepy children who pester the Doctor with questions, jokes and riddles. Then there is a man who wears a tricorner hat who turns out to be Gulliver from Gulliver's Travels and speaks as if he is straight out of the book. But the greatest threat from this world isn't that they could fall victim to any of the characters but that the TARDIS crew could become fiction themselves. It is important to say that there is nothing in The Mind Robber that is played camp. In fact, there is nothing camp about this story with things from the onset set out to be deliberately creepy like the clockwork soldiers who lumber about the forest. It is also evident that this story is an ironic play on the fact that Doctor Who was considered a children's programme so they used characters from children's fiction. All the characters that are used here also come from British Fantasy novels presumably from their fantastical look and feel with characters from the works of Carroll and Charles Dickins popping up all over the place. It is not to late into the adventure that the Doctor meets the person in charge of this world known only as The Master. No, he's not the Master who is the Doctors rival originally played by Roger Delgado but a children's author who was kidnapped a long time ago to serve as ruler of this strange land. 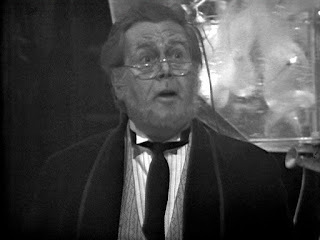 But the problem is the Master is getting on in years and his control over this land isn't what it used to be so he has set out to find his replacement, naturally he finds one in The Doctor. The Doctor of course refuses and triumphs in a battle against the Master in a few scenes where they bring different fictional characters in to do battle with another in an attempt to outwit each other. It is Jamie and Zoe who win the battle though as they manage to overload the master brain and free the Master, the man it had been using before they all manage to escape back into reality. But this is one of the beauties of this story, is that where it really ends? The question is unanswerable as it really is a question of did it really happen at all? And if it did, exactly what happened? There is no clear indication of when the fantasy elements included in this story really take hold and where the journey into the land of fiction really happened. Could it be when the TARDIS breaks up or could it be at nine minutes in when the Doctor closes his eyes to try and fight the dream visions. Could it have started when Jamie and Zoe go out into the white wilderness which looks suspiciously like a blank page or when they are all breathing in the mercury vapour from one of the TARDIS's damaged circuits, that stuff can't be good for the brain! Or, perhaps they have always been there, after all the Doctor is a fictional character, which leads us to wonder whether it is even possible for him to escape the traps that threaten to make him fictional. Even stranger still is that there is no real conclusion to this story with the TARDIS just fixing itself. But there is no "yay back in reality!" moments, not until the beginning of the next story, The Invasion. Weirder still, at the beginning of The Invasion there is no Master, who presumably went with them and not one of them notices. Could he have been a figment of their imagination, someone they conjured up as a person to rescue? Did they really escape back into their reality or just into a form of reality that they preserve to be the real one? You can understand why this story wasn't held in much regard from the viewing audience in 1968! But The Mind Robber had an impact on the show, not least in Amy's Choice, a story from the Stephen Moffat era in 2010 which was set in a fictional reality and the characters had to decide which one was real and which wasn't. Could it be possible that the Eleventh Doctor, Amy Pond and Rory were transported to the land of fiction? But The Mind Robber gets even more complex when you take a wider look at it as there were a number of purely coincidental mistakes made by the production time that can be written off thanks to themes in this fictional reality. One of these is how they cleverly write Frazer Hines out of a couple of episodes because Hines caught chicken pox and had to miss a whole filming week. So in the second episode we get a remarkable sequence where the Doctor has to fix his companions face only to get it wrong and we see Hamish Wilson take up the role of Jamie for a couple of episodes. The whole sequence is remarkably creepy but it shows us that anyone could play Jamie as Wilson does an excellent job. Maybe it was a play on the fact that anyone can play the Doctor when he changes?! And there is a great blink and its gone moment in the first episode where, after the Doctor saves Jamie and Zoe from the white robots and pushes them back into the TARDIS on the scanner screen above them are left the words, PRODUCER: PETER BRYANT. The characters are in effect watching the credits to their own show! As I stated above, the resonance of The Mind Robber is also strange and how it has effected the show as a whole. At one point the Master says he was responsible for the creation of the character Captain Jack Harkaway, a name that bears a striking resemblance to future companion Captain Jack Harkness, but with Stephen Moffat having created Captain Jack, this could be a direct link to this show. The Mind Robber also cast a shadow of doubt on whether the Doctor is actually from Gallifrey, something that isn't mentioned again until the final story in the Troughton era, The War Games. Here it is implied that the Doctor is a traitor but one can only be a traitor in the land from which one comes from. There are also another couple of odd connections between this story and a few others. The War Games sees the Doctor exiled to Earth and the last we see of him is spinning away in a black vortex much like the one when the TARDIS explodes in this story. Then later in The Deadly Assassin, the Doctor battles the real Master in a realm of fantasy, a realm the Master claims to have complete and utter control over. All these stories share another connection, actor Bernard Horsfall. Could it be that he is also a time traveller? Gulliver is also the perfect character to keep popping up all over this story as he is a wanderer who has a habit of going to the far corners of the world and encountering aliens, he is just as much like The Doctor as the Doctor is! The Doctor even describes him as just as much a traveller as them. The only reason Gulliver's Travels isn't science fiction is because the term for the genre hadn't been invented then when it had been invented in 1726. It is also weird how the Doctor knows who Gulliver is almost right away and can quote the book word for word but, in a world populated by fictional characters, whose to say that the Doctor and Gulliver aren't the same person?